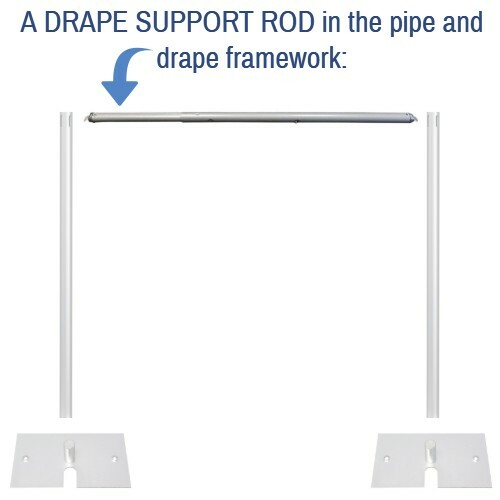 Drape support rod (crossbar) adjusts in width anywhere between 8 feet and 14 feet wide. 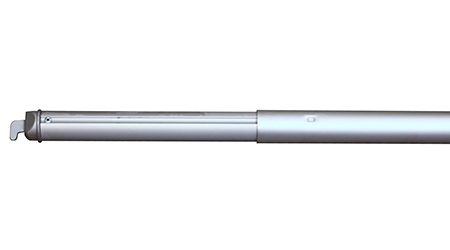 Button stop locks the width at 10 feet, 12 feet, and 14 feet for quick measuring at the most commonly used widths. 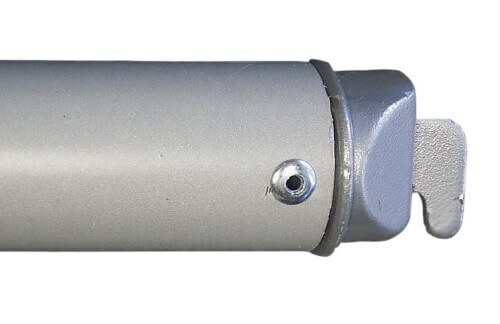 Telescoping support rod has a 1.5 inch outside diameter. This crossbar works with all of our uprights. 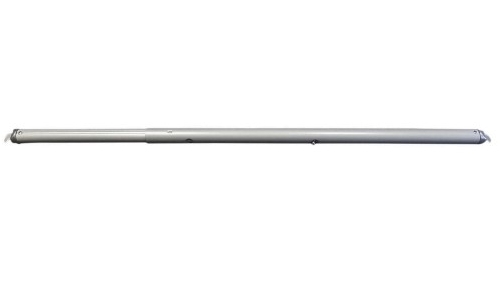 Aluminum pipe features a steel hook on each end that is cast in aluminum for supreme durability! End hooks easily slip into one of the 4 slots in our uprights. Supports a maximum of 15 pounds of evenly distributed weight. This is for the drape support rod (crossbar) only. Uprights and other pipe sold separately. This is my go to company for pipe and drape, due to cost, consistency, quality products and reasonable shipping. I never had any issues with any of their products, with the exception of the 8-14ft adjustable support rod. When I went to adjust the bar to 12ft the entire rod came out. For some reason the stop button didn't pop up. Upon further inspection the fixture its attached to was turned sideways inside the other rod. It took about 10 minutes to get it out. It was easy to put back in, but it kept turning sideways and then when it stayed it was tricky getting the button to pop up. When receiving your order you should inspect it immediately and make sure all components are working. I called Customer Service and they sent me another one which arrived right away. I will continue to order from this company. Hi Karen! Thank you very much for taking the time to write a review -- your feedback means the world to us! Sorry to hear that there were some initial difficulties with your crossbar, but glad to hear that we resolved it for you quickly with a replacement. Absolutely, we certainly recommend inspecting all parts upon delivery; each item is tested here as it is packed in the warehouse, but there is no telling what may happen during transit. If there's anything that we can do to further assist, we're happy to help. We appreciate your input, and we look forward to working with you again soon! Made in US, great quality, fast ship. We bought these to use with the drapes that we purchased to use with our DJ sound service for local pageants and other events. This items gave me the length i needed to make a canopy for the bride and groom. Good product overall but I did have problems getting it to collapse down. Probably bec ause its new. Reply from PipeAndDrapeOnline.com: Hi Chris! Thank you for your order! It's possible that it's just a bit stiff before it "breaks-in" a little, though if you continue to have difficulty with the pipe, please let us know and we'd be happy to help. The adjustable support is a great addition to your pipe and base system. By offering adjustments in the length, your system is more flexible to meet a variety of set-ups. Longer spans (12 feet or more) will cause a slight bow in the middle of the pipe. Great pricing, too! A: Hi Garth! I would be more than happy to help you. All of our hook ends are made of metal, to create both maximum stability and durability. Please feel free to contact us with any other questions. Thank you! Weight (Approximate, Each): 4 lbs. 9 oz.